Brooklyn Digest: Books: "Handcrafted" By Clint Harp, Resident Carpenter on "Fixer Upper"
Books: "Handcrafted" By Clint Harp, Resident Carpenter on "Fixer Upper"
Clint Harp is the star of Wood Work on the DIY Network and he is the resident carpenter on Chip and Joanna Gaines' smash hit Fixer Upper. 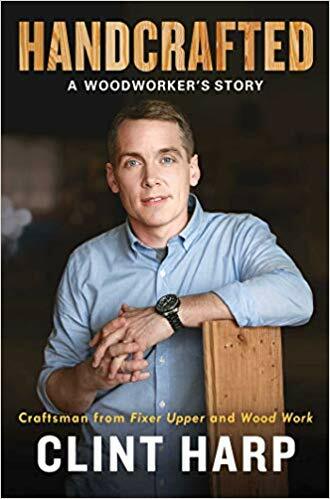 In the new book Handcrafted: A Woodworker's Story, Harp writes an inspirational memoir for anyone who ever considered turning their craft into a career. wanted to see what he would build next. The journey Harp took to stardom was not easy or straighforward. This memoir is a love letter to hard work, risk-taking, and the bonds of family. Handcrafted documents Harp's journey from developing a lifelong interest in woodwork and craftsmanship from his grandfather to trying out different life paths in ministry and then working in sales to support his young family, to eventually taking the big leap (with the support of his wife Kelly) to quit his job and follow his dream of being a carpenter. "There's this common but amazing story of something being left for dead and brought back to life that I'm drawn to. It had a deeper meaning. I felt that way about myself. I was living my life one way doing the sales thing, which was fine, but I didn't feel like myself. For me, I'm kind of reclaimed as well." Clint started the Harp Design Co. with his wife out of their garage in Houston, Texas. The original plan was to build furniture, but while he had the tools and the time, he didn't have the savings to invest in the raw resources. That led Clint to begin using the wood from shipping paletts he managed to scavenge from grocery store dumpsters and old construction sites to build his first tables. This led him to develop a love for reclaimed wood that remains part of his signature style to this day. While Clint was figuring out how to best make furniture, Kelly was accepted into a graduate program at Baylor, and the Harp family relocated to Waco, the city where Clint and Kelly both went to college, met, and got engaged. Clint now needed to support the entire family with the wood working business, so the return to Waco was off to a rocky start. Right when Clint was on the verge of giving up on his dream and going back into the workforce, he had a chance encounter with Chip Gaines at a gas station that changed their lives forever. "We didn't know each other at all, but somehow, that afternoon, we ended up driving around Waco for three hours just talking. He showed me some projects he and his wife were working on. I told him about quitting my job. He told me about their new development. I explained I was volunteering with Habitat for Humanity. He said that they had four kids. At the time, we had two. He built houses. I wanted to build furniture. On top of being an interior designer, his wife had been selling the home goods she curated to anyone who'd buy them, and she was hoping to add a furniture line. Kelly was pursuing her master's but had previously designed baby clothes and home goods and had a great eye for home decor. They didn't quite know where their lives were headed. Neither did we. Chip Gaines said of Harp, "I'm proud of Clint. I'm proud of the husband and father he is, and I'm proud that he's my friend. He's the kind of guy who just bears down and gets stuff done. I'm glad he took the time to put his life story together, and I'm honored to have played a small part. Don't be dumb...read this book!" Former President Jimmy Carter says, "A fellow craftsman from Georgia, Clint shows how to live life as an adventure. From the floor of his first shop to the foundations of Habitat for Humanity houses, to building furniture for the world to see, Clint Harp is living a handcrafted life." Handcrafted is one of the most inspiring books you will read all year, from someone who stuck with his dreams and found stardom doing what he loves.